In the last seven months we have traveled over 10,000 miles through Mexico and Central America in the truck, and over 2,400 miles on the Mosquito (motorcycle). I have been the navigator. I plan the route, and am responsible for getting us there. I think people who know me would be really surprised, since I'm known for getting lost. I never use short cuts, and rarely deviate from a route that I know. However, I can read maps and use a GPS. It wasn't that I didn't have a sense of direction, I just didn't pay attention to my overall surroundings and take the time to understand where I was in relation to what was around me. With a new sense of awareness and observation, I have been able to get us through foreign lands without many mistakes. I try to always have an actual road map for reference, and to more easily see the big picture. I also have a Garmin road GPS and Google Maps on my phone. Google Maps is what I have relied on most. 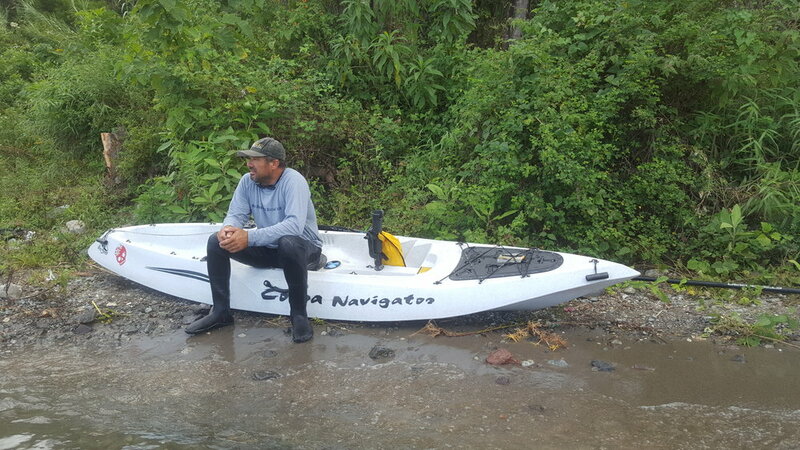 Jorge also has a GPS that he uses on the water and in more remote places. It has main roads but not streets. We can use it to record a track on a trail, off road, or on the water, so we know how to get back. Jorge also has an external antena for that GPS, with a magnet so he can place it on the hood of the truck. Apparently it picks up 6 satellites instead of 3. While I have been the navigator, Jorge has been the driver. I'm the travel agent, he's the tour guide. Jorge is the cook, I am the dishwasher. He's the joker, I'm the voice of reason. PJ is always the tourist. The journey from Yucatan, Mexico to Guatemala was long and exhausting. We headed toward Palenque, Mexico in the late afternoon and drove until darkness covered our path. We had a good nights rest in our trailer at a Pemex gas station along the way. Just like before, they asked for a couple dollars to watch over us through the night. We got up before the sun the next day and got back on the road to Palenque. Our plan was to leave our trailer somewhere in Palenque, and continue through Central America with just the truck. Consequently, we would have to rent places along the way. We decided to do this because we heard many roads weren't well maintained, there weren't many RV parks, and rentals could be found quite cheap in Central America. The new plan was to look for a place in Palanque, Mexico to leave the trailer - maybe someone's property, a hotel or restaurant, or maybe a campsite. The hours ticked by as we stayed focused on getting to Palenque. We arrived around 3 pm, and immediately started scoping the place out. It didn't take long to find an old house on a large property, with the family outside cooking. They were happy to let us use their property for a small fee, but in the end we couldn't agree on where it would be parked on the property. We had to continue our search. We drove in circles for awhile, finding a couple more possibilities that don't work out. We were both pretty drained when we finally found a hotel / restaurant that had a perfect spot for us. We give them a couple hundred dollars to park it and watch it for the next four months. We prepped the trailer for our departure, then fell asleep watching the last presidential debate. The next section of road between Palenque and San Cristobal was known to be a treacherous ride through the steep mountains. It definately proved to be an adventurous, curvy, steep and narrow road. We left when it was still dark. We had to be careful of people walking along the roadside, since there was no shoulder. Most were men, and I quickly noticed that 99% of the men were carrying machetes. There were huge unmarked topes (speed bumps), and numerous horrible potholes. There were even places where people were holding a thin rope across the road to block our truck and asking us to contribute some coins to the Virgin Mary. Although it was a little stressful to be so alert on this long drive, the scenery was absolutely breathtaking. We saw the sun rise over the rugged mountains while the clouds drifted between them. We arrived at the Mexico/Guatemala border a couple hours before dark. It was chaotic, with no organization. We had an idea of what to expect from internet research. We had our passports, birth certificates, drivers license, registration, title and proof of insurance for truck and motorcycle, PJ shot records and international health certificate. First we have to check out of Mexico, so they know we have left their country. Second, we have to check in to Guatemala. After about three hours and running back and forth between windows and buildings, we finally get through. 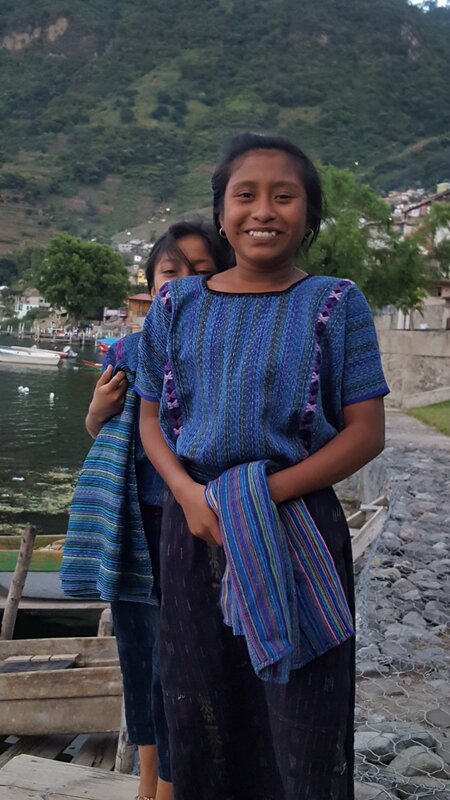 We choose to stay in Lake Atitlan for our time in Guatemala. 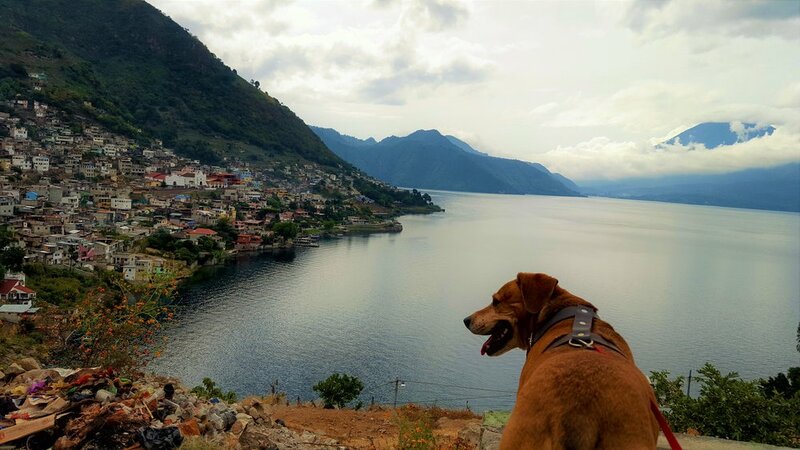 Lake Atitlan is a lake in the Guatemalan Highlands of the Sierra Madre mountain range. 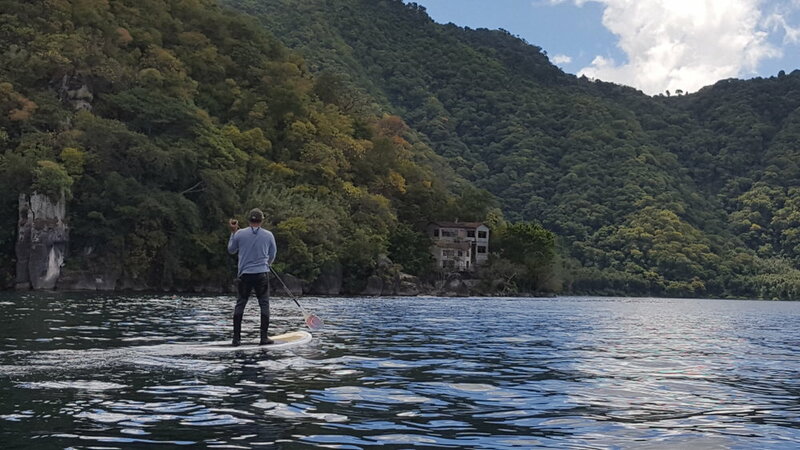 Thirteen Mayan villages lie around the perimeter of the lake, each with their own personality, and each known for something different. The climate has been described as an eternal spring, and considered one of the best climates in the world. 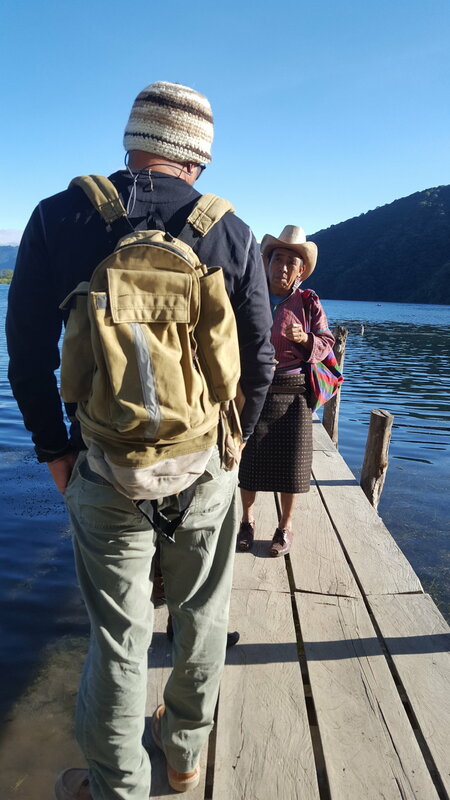 I was also lured to this area by stories of the colorful and rich Mayan culture, vibrant markets and the beauty of the lake. 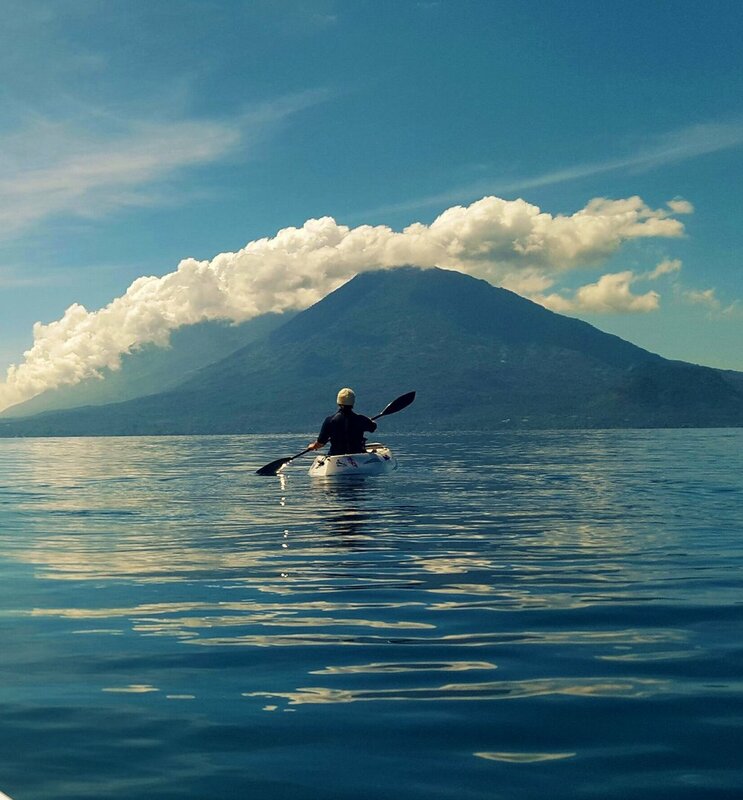 Lake Atitlan was said to be stunning and clear, with volcanoes and mountains rising up around its edges. 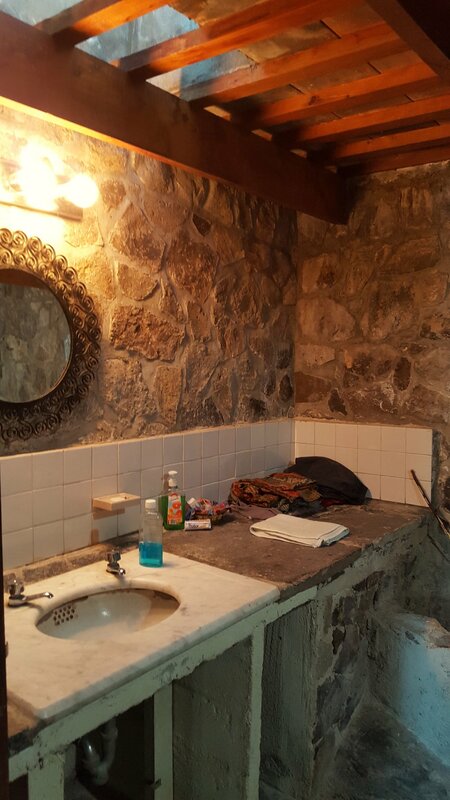 Before we left the Yucatan, I found a rental house for us at Lake Aitilan. I looked for rentals on www.vrbo.com, www.airbnb.com, www.flipkey.com, www.homeaway.com, www.longtermlettings.com, and then I also check out other sources like property management companies or private owners I find over the internet. 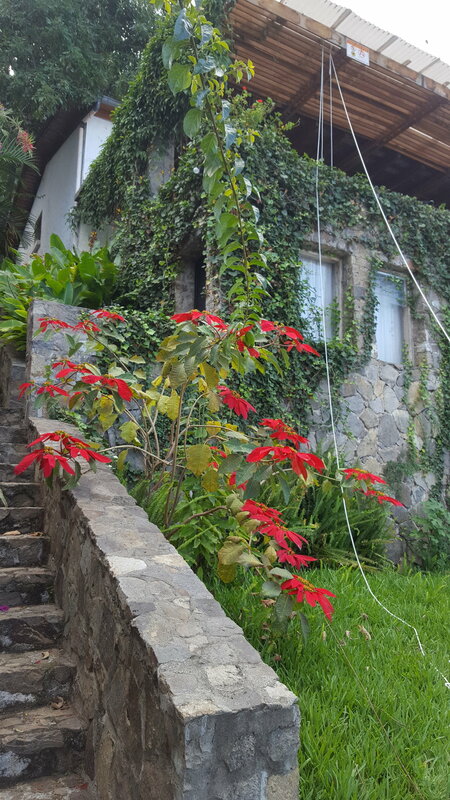 I found the rental house in Guatemala from a local real estate company. I found them last minute, three days before our arrival. They had one house that was MUCH more than we needed, but it had been vacant awhile and they wanted someone there. It was also the only one they had that would allow dogs. It was located in the village of San Antonio, right on the lake. Five bedrooms, three baths, a fireplace, and a huge deck overlooking the lake. Like I said, much more than we needed. No television. The closest internet was in the next village. They gave it to us for $400 for 3 weeks. It was just a lucky break, and the place was absolutely wonderful. Photos of the house below. Unfortunately, the main road to San Antonio was being repaired, so we had to take the back route which was much longer. It also required a 4wd. Photos below. We settled in. We walked to the mercado in front of the old church to stock up on food. We started to explore. 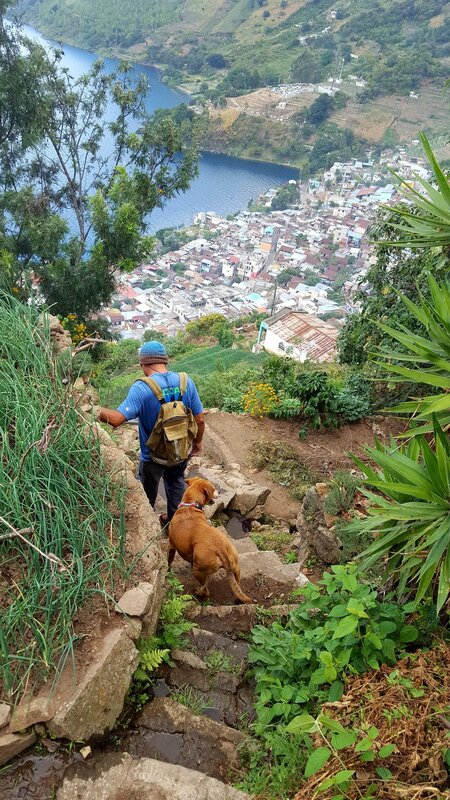 San Antonio was a quiet and picturesque village that rested on a mountainside along the shore of the lake. It was a very laid back and simple place. There was one hotel and only a couple of restaurants. The church is near the center of the village and a natural focal point. Their cemetery was spread on the hillside. The indigenous people wore traditional and very colorful woven garments and headdresses, which added to the ambience. Photos of San Antonio below. 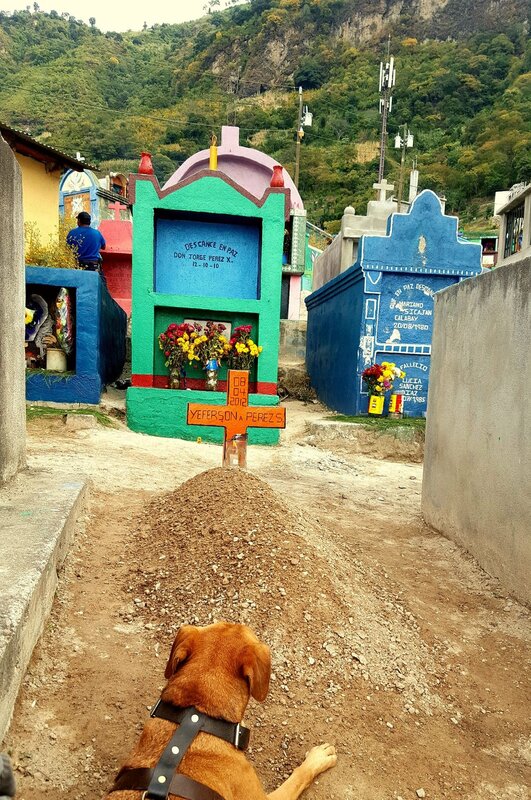 We happen to be in Guatemala for Dia de los Muertos (Day of the Dead). People celebrate with kite festivals in various locations. The festival is a way to remember their lost loved ones. People create elaborate, large and colorful kites, and they are flown in local cemeteries throughout the country. I realized later that kites are very popular in Guatemala at any time of year. We would see remnants of handmade kites hanging off rooftops and electrical poles all over the place. We saw kids flying kites during the entire time we were there. From sun up to sun down you could find kids in front of our rental house flying their kites on the edge of the lake. You could also look up the hillside and see kids flying their kites out of their windows or on rooftops. Most homes in San Antonio didn't have glass in the windows. A couple days before Dia de los Muertos, Jorge decided he was going to make a kite. He decided to build it with the tent poles and the rain cover of our tent. He designed it, and then redesigned it a couple times after it landed in the lake. After he was happy with it, he gave it to a couple little local boys. On Dia de los Muertos people come to the cemetery to paint and decorate the headstones of their relatives, and leave candles and flowers. Many family members stay at the cemetery all night, bringing dinner and listening to music. Our house had a view of the hillside cemetery, and when it became dark we could see the twinkle of the candles, and hear the music. It happened to rain hard late that night, but the people stayed and the music continued. 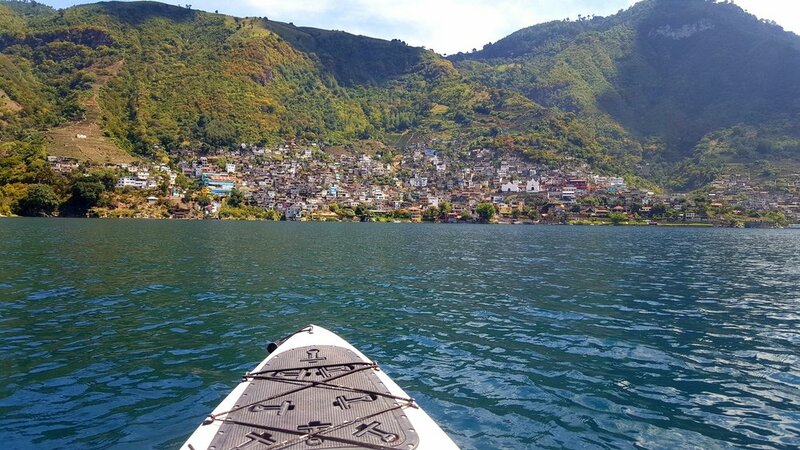 We spent a lot of time kayaking and paddling on Lake Atitlan. There were very few boats on the lake. We only saw the small water taxis that take people from village to village, and the small wooden fishing boats the fisherman used. For that reason, the water was very clean and clear. 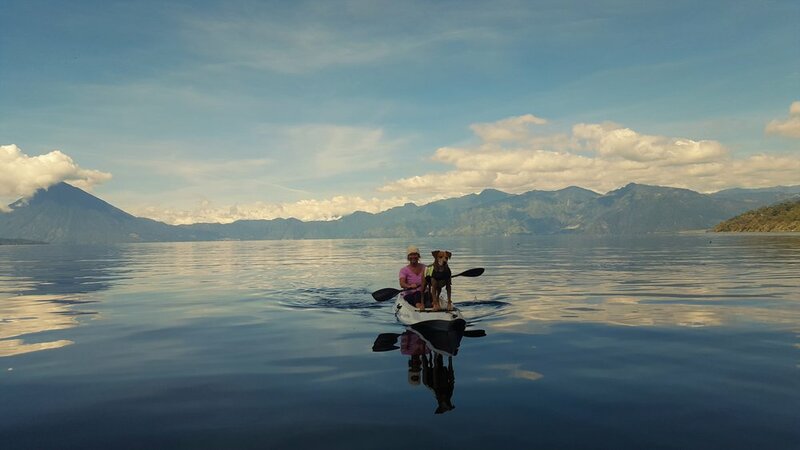 The lake is approximately 50 square miles, and the deepest lake in Central America. 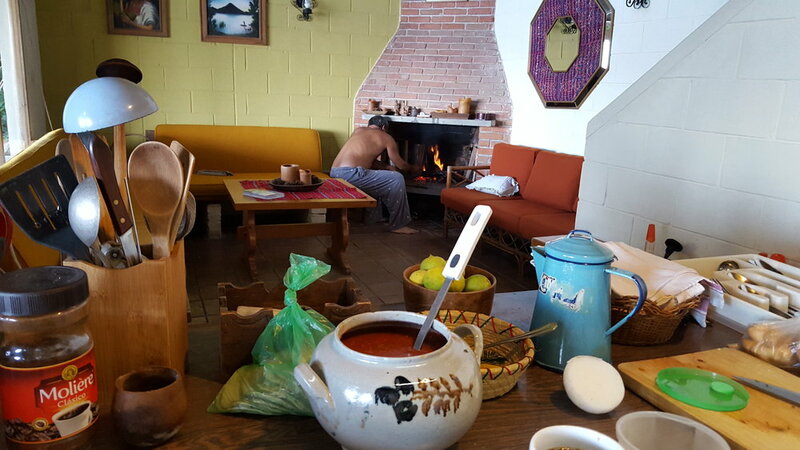 The village of Panajachel is known to be the main tourist center, entry point of the area, and the transport hub to other villages or cities. It was filled with worldly backpackers, souvenir stands, restaurants and shops. It's a fun place to visit, with the only complaint being the vendors were very aggressive. Maybe they are so persistent because they are forced to sell their high quality handmade items for so little because there is so much competition between the sellers. The general rule is that they initially ask for double what they are willing to take. 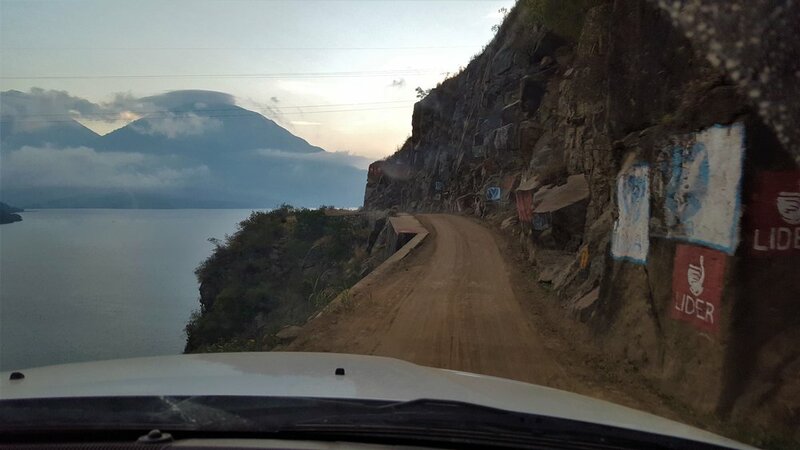 We drove the mosquito to Panajachel every couple of days. We bought our groceries and did our laundry there, and went there to take water taxis to other villages. 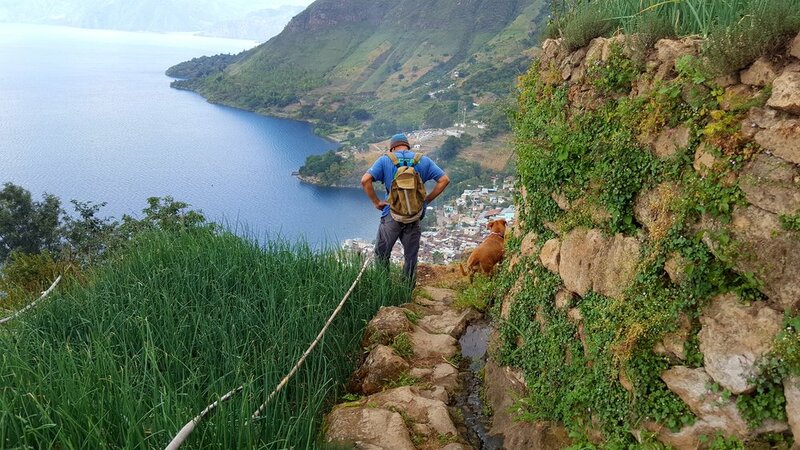 Lake Atitlan is also a great place to hike. 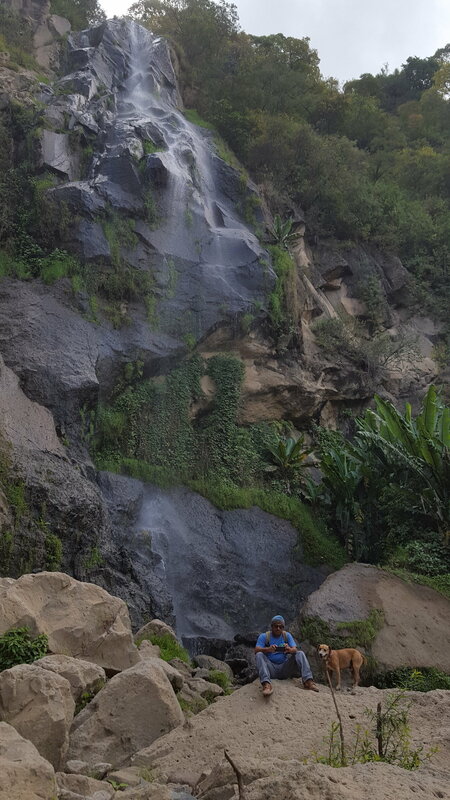 One day we hiked up beyond the village on San Antonio, past the onion fields to a beautiful waterfall. The waterfall feeds the onion fields below, by a network of narrow trenches that weave down the mountain and through the fields. Photos below. One day we decided to take a bus to Antigua. Antigua is a UNESCO World Heritage Site. You could hear horse and carriages clicking through it's cobblestone streets, past the old churches, Spanish style architecture and beautifuly restored homes. Shopping and restaurants were outstanding. It would have been better to stay at least a couple of days. During our three weeks in Guatemala, we only drove our truck one time. Instead we drove the mosquito (motorcycle), chicken buses, tuk tuks, and community trucks. Chicken buses can be taken between villages, to other cities, and even to different countries in Central America. The buses are school buses from the US, that are auctioned off when they reach 10 years or 15,000 miles. People in Guatemala paint and decorate them, adding to the already vibrant flavor of the country. They are a really inexpensive way to travel, I think we paid a couple cents to go about 20 miles. They are known to be fast, fun and sometime dangerous. When we got on, the bus driver didn't stop, he just slowed down and we jumped on. Photos below of chicken buses. The "community trucks" (my name for them) are smaller pickup trucks, that have a metal frame over the bed. In addition to carrying people, I've also seen these truck carrying livestock. They park in various areas, and you just pile in the back. The are usually really full, with everyone squeezed in standing up. One day we took a community truck with PJ. He squeezed in with all the people, and when the truck started moving he laid down and put his head on a man's foot. 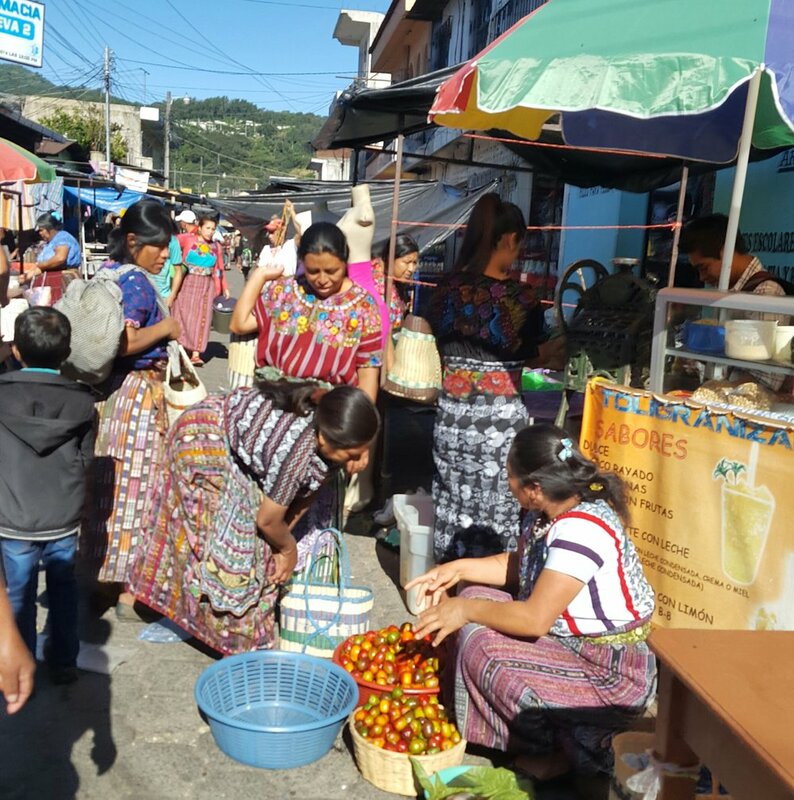 I loved the bustling local markets of Guatemala. Every village had their own, on a scheduled day of the week. We probably visited seven or eight markets. In addition to fruits and veggies, spices, live chickens, meats and cheeses, they also sold their crafts, textiles and garments. 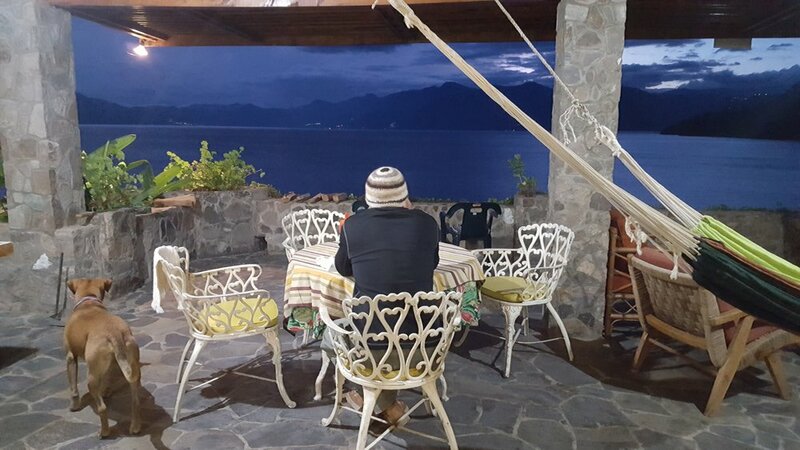 Lake Atitlan was full of good vibes, and I hope to return one day.